Exeter City's football manager Eamonn Dolan bowed out from the Devon club on Tuesday night. Despite an emotional farewell to the Grecian's boss, there was no fairytale ending for his reign at the club, who lost 3-0 to league-leaders Barnet. Thousands turned up to say goodbye to the man who has served the club for the past 13 years and is now heading to manage a youth set-up in Reading. 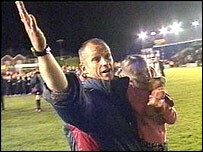 Eamonn Dolan's playing career at Exeter was cut short due to cancer. After extensive treatment, he came back to work with the youth set-up and took over the first team when Exeter's fortunes had reached a very low spot. 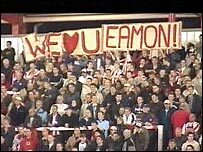 The club had been relegated from the Football League and risked being wound up because of its debts. Mr Dolan says it may not have been the way he would have liked to have departed St James Park, but he was delighted with the crowd's response at the end of the game. He said: "This was such a special way to bow out. "It was both special and humbling and I will remember that for many a day. "To leave Exeter City was one of the hardest decisions I have ever had to make. "This last year has been the best year of my life and something I will never forget. "The club got me a laptop computer, which is nice, but I would rather have had the three points." Exeter City have posted an advert on the club's website seeking applications for the vacant manager's post. The advert says the new man will be working alongside Director of Football Steve Perryman and assistant manager Scott Hiley. It also says candidates should understand the constraints of running a community football club.